Paws of Enchantment provides links and articles of interest for pet owners on a variety of topics, including spay - neutering, Saluki's, cancer, pet wellness and more. Excellent article with important things to consider when making the decision to neuter your dog. Welcome to Pet Wellness Update, a website dedicated to reform rabies laws nationwide to exempt sick and senior dogs and cats from mandatory rabies booster shots when they are in the care of a licensed veterinarian. In 2005, I took a healthy 12 year old calico house cat for a rabies booster shot. Within six months, she began to show signs of ill health - dramatic weight loss, great thirst, poor coat, bad breath, eye discharge, ear mites, frequent urination and frequent vomiting. A year later, after a roller coaster of treatment, progress and regression, in the midst of an ice storm unprecedented in Texas history, Aimee was in kidney failure and dying. I wanted her passing to be painless and peaceful. 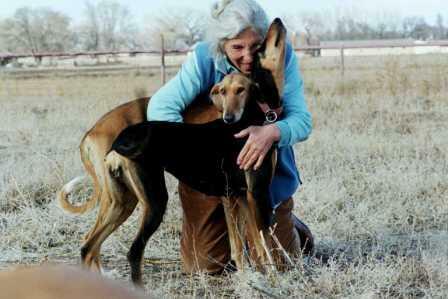 Beautifully written and historically rich articles about the history of the Saluki in its native lands. Please explore the link below to begin a wonderful and unforgettable journey... one lived and documented by Gail Goodman, one of the breed's premier historians. For those of you who enjoy these articles you may also wish to acquire a copy of Saluqi: Coursing Hound of the East. This unique and unforgettable volume is available in a very limited quantity, directly from the publisher. Perhaps no aspect of pet ownership in the U.S. elicits as passionately supportive emotions as the subject of spay and neuter.